Children should be physically active each day as part of play, games, sports, active transportation, recreation and physical education. This includes outside activity that encourages children to explore a natural environment and take risks. It is important that children participate in all different types of activities to meet the Canadian 24-Hour Movement Guidelines. This set of 10 small posters (8.5″ x 11″) promote various aspects of physical activity in young children and refer parents and caregivers to the bilingual Have a Ball Together website. 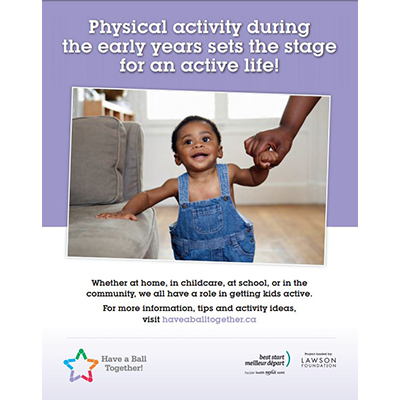 The posters can be downloaded and printed easily, so you can share them with families, or hang them in your space to remind you about the importance of physical activity for children. Purchase the high-resolution PDFs to print large quantities and hand them out!